Cary Elwes was inspired to share his memories and give fans an unprecedented look into the creation of the film while participating in the twenty-fifth anniversary cast reunion. In As You Wish he has created an enchanting experience; in addition to never-before seen photos and interviews with his fellow cast mates, there are plenty of set secrets and backstage stories. Cary Elwes is a celebrated English actor who starred in The Princess Bride before moving on to roles in Robin Hood: Men in Tights, Glory, Days of Thunder, Twister, and Saw, among many other acclaimed performances. 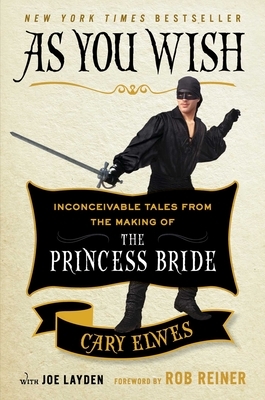 He will always be indebted to The Princess Bride, he says, for changing his life and giving him a career that has spanned decades. He lives in Hollywood, California, with his family. Find out more about Cary Elwes on Twitter @Cary_Elwes. Award-winning journalist and bestselling author Joe Layden has written more than thirty books for adults and children, including the critically acclaimed title, The Last Great Fight and the #1 New York Times bestseller The Rock Says. He lives in Saratoga Springs, New York, with his wife, Susan, and their two children.